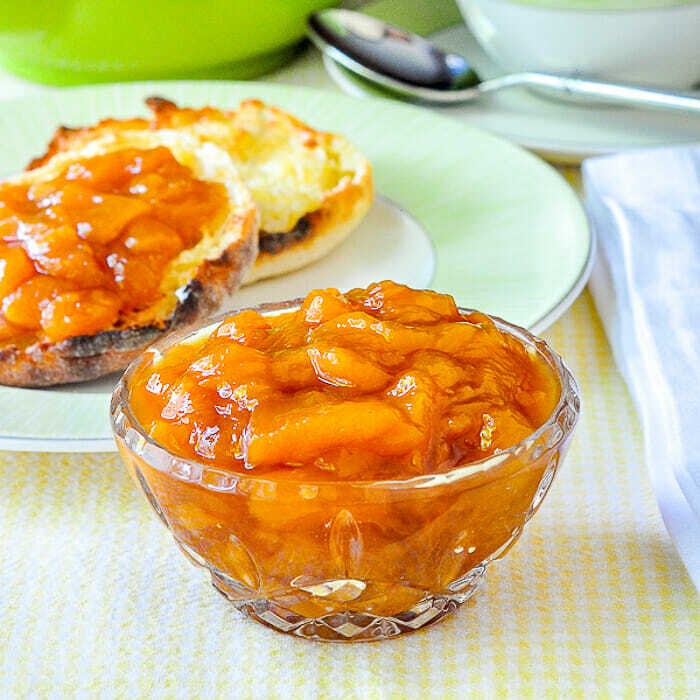 Easy Roasted Peach Jam - with only 3 ingredients! 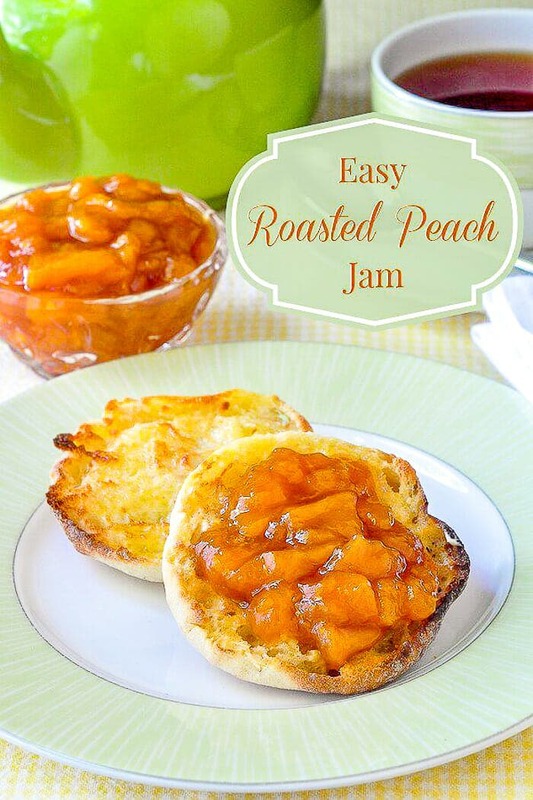 Easy Roasted Peach Jam. A super simple, 3 ingredient jam that you make in the oven, reducing and intensifying the flavour of the fruit as it roasts. No surprise, I overbought peaches again. No problem, whenever there is a surplus of peaches on hand, just like with strawberries, a small batch of roasted jam saves the day. It so easy to make and takes so little effort but the flavour of the fruit gets intensified many times over. The little splash of real vanilla extract gives a beautiful fragrance and complementary flavour to this simple jam. This jam is also terrific to use in a simple sweet biscuit shortcake recipe, served with a dollop of whipped cream. This small batch did not last long and Spouse was none too pleased that I had scooped up the last of it while she was making her morning toast. I think I’ll just buy more fresh peaches and make more for her this weekend. 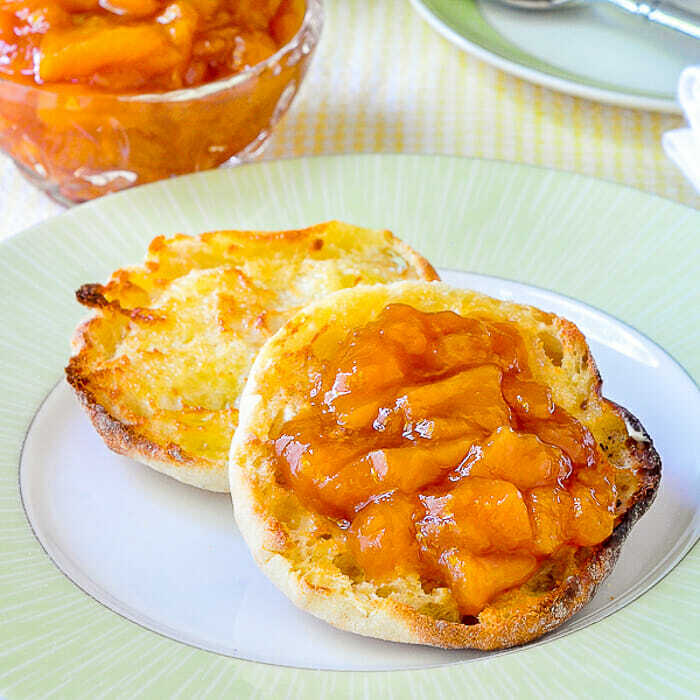 Like this Peach Jam recipe? 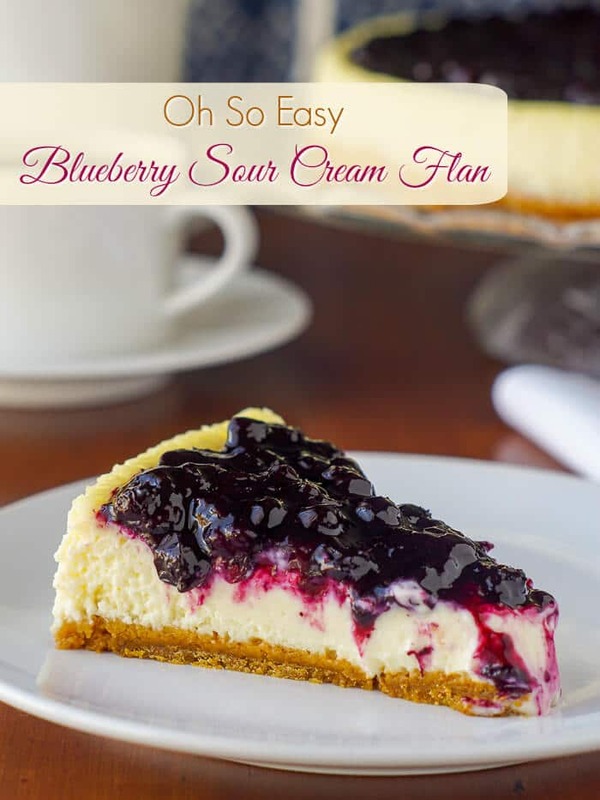 You might also like to try this jam instead of blueberry on top of our super easy Sour Cream Custard Flan. Easy Roasted Peach Jam - a super simple, 3 ingredient jam that you make in the oven, reducing and intensifying the flavour of the fruit as it roasts. Toss the peaches, sugar and vanilla extract together in a glass baking dish. Roast in the oven at 350 degrees F stirring occasionally until the jam reduces and the juice almost completely boils off. Watch it closely toward the end of the cooking time because the sugars will be very concentrated and will more easily burn. Cooking time will vary depending upon the water content of the peaches and the depth of the baking dish. Allow up to 90 minutes for the jam to cook fully. This is a small batch jam but it can be scaled upward if you wish to make more. Let the consistency and taste of the of the jam be your guide to when larger batches are ready. Larger pans will take a longer time and it is important to scrape the sides of the pan and stir every half hour or so. The jam can be preserved in mason jars using a water bath as instructed by the jar manufacturer. Can I can these for the shelf in my cold room? Is there a sugar free method? I don’t usually make sugar free jam but you can try. I also don’t use artificial sweeteners so I can’t offer any help there. Roughly how much jam does it make? Is it the low-sugar kind that should be stored in the fridge? Any chance of metric weights for the recipe? So looking forward to making it! Just found this recipe and looks so inviting. After you finish baking the peaches, what next. Do you refrigerate? How long will it keep? Do you can them, if so, what is the procedure? Recipe has now been updated with more info. Can you please answer people’s questions? I do answer questions but I am not online 24/7. This website sees up to 2 million pageviews a month and that generates a lot of comments and questions both here and on social media. I just got back from 3 weeks vacation too, so I have been playing a lot of catch-up on a lot of things. FYI the recipe has now been updated.